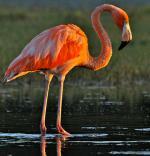 American Flamingo: Tall, unique wading bird, entirely pink except for black-tipped bill that is bent at a curious angle. Feeds on algal material, bacteria diatoms, plankton, small fish and brine fly larvae. Direct flight with rapid wing beats. Flies in straight line formation. Formerly known as Greater Flamingo. 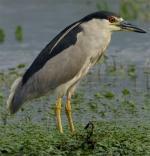 Black-crowned Night-Heron: Medium-sized, stocky heron with short neck and legs, black upperparts, gray wings, and white to pale gray underparts. Stout black bill, red eyes, and yellow legs. Feeds on small invertebrates, crustaceans, vertebrates, mammals, eggs and young of other birds, and plants. 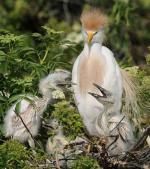 Cattle Egret: Medium, stocky egret with white body and pale orange-brown patches on head, neck and back. Eyes, bill and legs are orange. 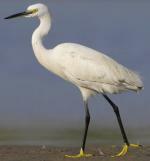 This is the only white egret with both a yellow bill and yellow legs. Feeds primarily on insects disturbed by livestock. Direct flight on quick steady wing beats. 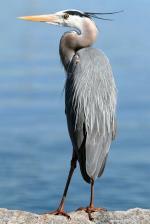 Great Blue Heron: Large, elegant heron with blue-gray back, black sides, and gray-and-white striped belly. Long neck is gray with black-bordered white throat stripe. Head has white face, cap, and black crest. Upper mandible is dark, while lower mandible is yellow. Direct flight on steady wing beats. 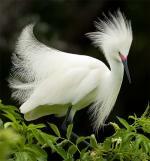 Great Egret: Large, white heron with yellow eyes. Bill is yellow, may appear orange when breeding. Black legs and feet. Long feather plumes extend from the back to beyond the tail during breeding season. Feeds on fish, frogs, insects, snakes and crayfish. Bouyant direct flight on steady wing beats. 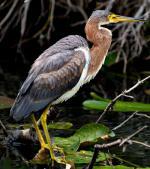 Green Heron: Small heron with gray-green upperparts. Head, neck, upper breast are chestnut-brown, belly is paler brown. Head has green-black cap with small crest. Throat is white and neck has white central stripe. Bill is two-toned with dark upper mandible and yellow lower mandible. Direct flight. 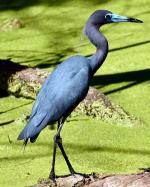 Little Blue Heron: Medium heron with slate-gray body and purple-blue head and neck. Eyes are yellow and bill is dark gray with black tip. Legs and feet are dark. The only dark heron species in North America in which the juvenile is white. Feeds on small crustaceans, vertebrates, and large insects. 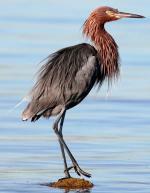 Reddish Egret: Medium egret with blue-gray body and shaggy, pale rufous head and neck. Bill is pink with dark tip. Legs are blue-gray. 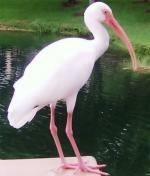 White morph has all-white plumage, black-tipped pink bill, and blue-gray legs. Feeds on fish, frogs and crustaceans. Direct flight with bouyant steady wing beats. Sandhill Crane: Large wading bird with gray body, white cheeks, chin, upper throat, and bright red cap. Bill is dark and eyes are yellow. Legs and feet are black. Direct, steady flight on heavy and labored wing beats. Slow downstroke, rapid and jerky upstroke. Flies in V or straight line formation. 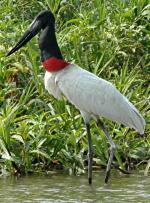 White-faced Ibis: Medium wading bird, iridescent bronze-brown overall, thin band of white feathers around bare red face, long, down curved bill. Red eyes, legs, feet. Feeds on invertebrates, frogs, fish. Alternates several shallow rapid wing beats and short glides. Flies in straight line formation. 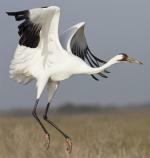 Whooping Crane: Large crane, nearly white except for red crown, black mask, and black primary feathers most visible in flight. Feeds on frogs, fish, mollusks, small mammals and crustaceans, grain and roots of water plants. Direct flight, slow downward wing beat and a powerful flick on the upbeat.